Where can you wear ‘bling’ or flamboyant attire? While showjumping and eventing attire is fairly relaxed, dressage riders are quite limited in terms of their flamboyance in the UK. British Dressage bans clothing decoration, except discreet manufacturer’s logo studs on boots; although patent leather boots are popular, and give a high shine. Conservative-coloured coats are required in BD competitions, although discreet pinstripe patterns are now de-rigour. So, your dressage saddle is the ideal place to add a little bit of interest! Within the field of showjumping, riders can express their fashion savvy a little more, as they may wear coloured jackets (providing they do not clash with the official ‘team’ jacket); perhaps to correspond with their own, or their sponsors’ colours. Dress codes for the XC stage of eventing attire are even more relaxed, as there are greater provisions for promotional material and logos on clothing, (albeit at a certain maximum size, or in a designated position on the rider’s clothes.) Bright and bold colour-ways are popular. Patent bridles or those with diamante or coloured accents are also popular to add interest, while leather riding boots in materials such as ostrich, crocodile or kangaroo are also popular with more flamboyant riders, particularly internationally. Riding helmets are increasingly being seen with diamante accents and patterns, as well as jewel-inspired colours – the trick is to keep it discreet, so your accents complement each other and don’t over power you and your performance. Within the eventing sphere especially, some riders are looking to their saddles to express their fashion sense, or coordinate their cross country colours. The leatherwork of all WOW saddles may be customised in the rider’s or sponsor’s colours; two-tone coloured leather is popular. Eventer Paul Tapner may currently be seen competing in a beautiful red and black XC saddle with fixed long blocks that give increased support for the leg. He also sports a more neutral Havana brown and maroon version of the saddle. Leading saddle manufacturer First Thought Equine now offers a personalisation service on all new saddles. 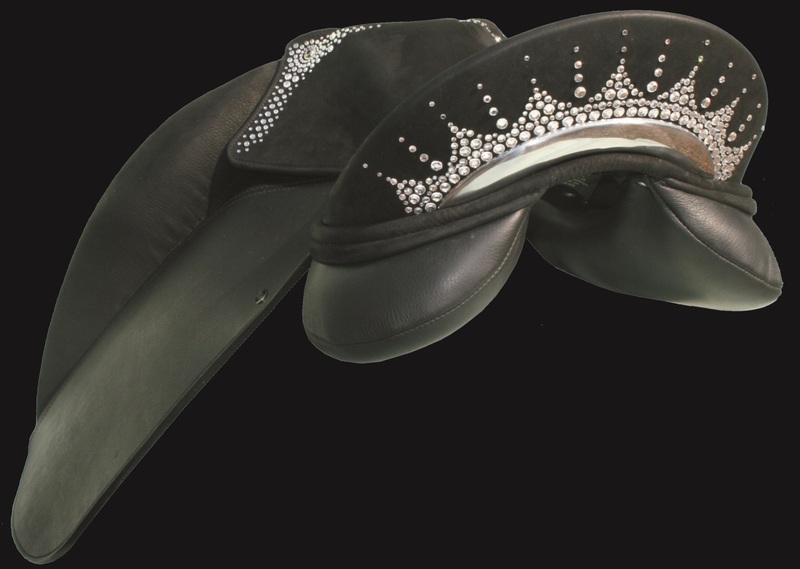 Customers can have the cantle and pommel areas customised with appliquéd diamante and crystals to suit their needs, either in a pattern of their choice, or to spell a rider, horse or sponsor’s name. The leatherwork of all saddles may also be customised in the rider’s or sponsor’s colours; two-tone leather is popular, for example. Eventer Paul Tapner recently commissioned a striking red and black saddle in his country colours. 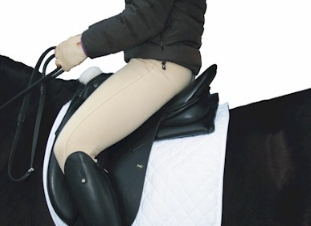 • Features Flair air bag flocking; a flexible, gaseous bearing surface that increases pressure distribution over the horse’s back & provides shock absorption. Call (44) 1227 831614 for stockists or visit www.wowsaddles.com. Flair is a system of four air bags, which are incorporated into your existing saddle panel, two at the front, and two at the rear. 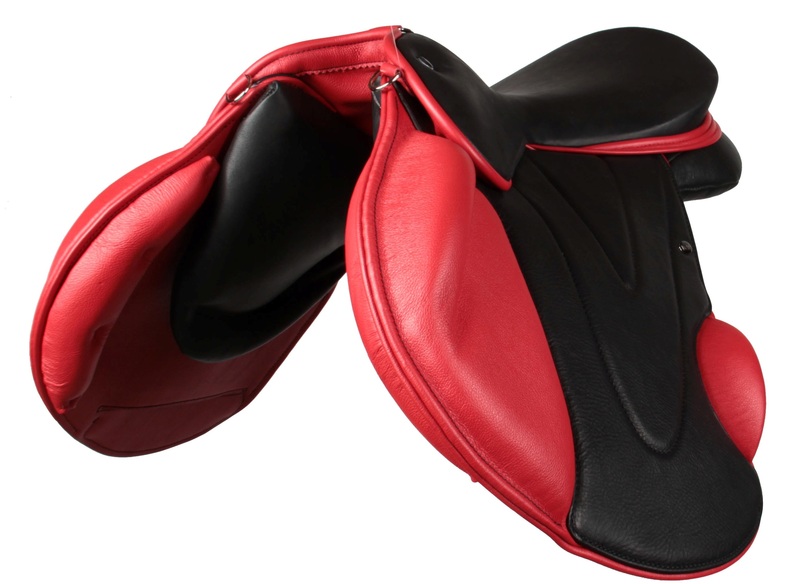 Flair air bags can be fitted to all styles of saddle i.e. Dressage, Jumping, General Purpose and Endurance etc. The air bags surround a foam insert which makes the air displace in such a manner that the saddle panel maximises its bearing surface on the horses back. The bags are adjusted via two valves that are fitted under the skirt of the saddle. The adjustments are made whilst the rider sits on the horse, the whole process taking a matter of minutes. The saddler is able to balance the saddle perfectly both side to side and front to back even if the horse has uneven muscle development. The majority of training problems relating to the control, balance and direction of the horse are caused by the horse’s discomfort in the area immediately under the saddle. The problem with saddles is the hardness and unevenness of the panel. All flocking materials over time become unevenly compacted, so creating both high pressure points and areas where the panel may not touch the horses back. A pressure as low as 1½ lbs. per square inch will in time damage minor blood vessels in both the skin and muscle leading to signs of bruising, hair loss and eventually muscle wastage. Pressure on or pinching of the withers directly affects the muscles of the shoulder, causing shortening of the horse’s stride and in many cases, difficulty when moving down hill. Soreness or restriction of the back muscles makes it more difficult for the horse to engage his quarters and so to come on the bit. Flair creates a gaseous and totally flexible layer in your saddle. This removes pressure points and increases the sensitivity of the horse to your lower back aids whilst also providing shock absorption for the horse when jumping or engaged in sitting trot (gases can be compressed whilst liquids, gels and solids cannot). Flair allows your horse to move naturally as the muscles of the back and shoulder are no longer restricted by your saddle’s panel. Korrector is the revolutionary saddle pad that uses air and foam technology; it can be adjusted by the rider to give full day to day control of the fit of the saddle, on one or more horses. Once adjusted, Korrector does not need to be altered unless the horse changes shape, or you wish to use it with another saddle or on a different horse – adjustments take a couple of minutes and are done with the rider mounted. What could be easier?